PARANORMAL ACTIVITY 3: Playing with Evil! Movie Review! 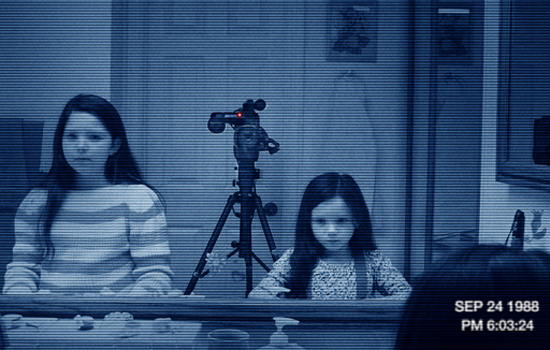 What started out as a low-budget innovative style in the horror film making genre, “Paranormal Activity” backed by a major studio , Paramount Pictures, quickly turned into a lucrative franchise. The third installment to the story of main character, Katie returns to keep fans hooked on what happens next. “Paranormal Activity 3” ties story lines from parts 2 and 3 in a way that digs even deeper into the complex origin of the demon that haunts Katie (Katie Featherston) and her sister Kristi (Sprague Grayden). The film starts-out with adult sisters Katie and Kristi going through old family belongings when they come across a box of VHS cassette tapes. The movie then transitions to the past to the year 1988 when the tapes were created by their mother’s boyfriend, Dennis (Christopher Nicolas Smith). Dennis was fascinated by strange happenings their new house just as Katie’s boyfriend was in the first “Paranormal Activity” film. The progression of filming heightens the demon’s presence. The demon, who goes by the name of “Tobi” can only be seen and heard by the youngest sister, Kristi. There are many new surprises in “Paranormal Activity 3” which opens a new chapter to the unraveling of the history of Katie and Kristi’s family background – main family member in question is the grandmother. The movie does a great job at recreating the look of the 1980s decade very authentically through the styling of hair, wardrobe, props, interiors, furniture and even down to the look of the footage of the tapes being recorded by Dennis. “Paranormal Activity 3” pleasantly gets back to the classic slow and suspenseful built-up of the demon haunting that thrilled fans the same way as in the first one. Viewers will see a progression in the evil energy residing in the home of the sisters, with a slew of evil climatic events during the final act. The film also explains the story of where part 2 left off at when it was revealed that the demon had a history with this particular family and an agenda. Fans can expect to see a part 4 which will hopefully dive further into greater detail to how the demon attached itself to this family to begin with, and how the grandmother got involved in a witch coven. I was left a little bit confused at the end of the movie trying to patch pieces of the story together from all parts of “Paranormal Activity”. I think the best way to watch them is in the following order: Part 3 first, then part 2, followed by part 1. “Paranormal Activity 3” opens in theaters Friday, October 21, 2011.